A glass is filled with drinking water. Water is a chemical compound consisting of a single oxygen atom bonded to two hydrogen atoms (chemical symbols: H2O). Clean water is essential to all known forms of life, and its unique properties make it invaluable for most industrial processes. While water in the liquid phase is abundant on Earth, its icy deposits on Mars make it into a critical resource to be treasured. 1.2 Evidence for liquid water? A new crater full of melting ice, as seen from the Mars Reconnaissance Orbiter. Nirgal Vallis, as seen by Mariner 9 This is one of the first images to show evidence of past water on Mars. Starting in 2004, the evidence of the presence of water on Mars has been mounting. The Opportunity rover discovered geological markers - stratification and cross-bedding - near its landing site which pointed to significant flows of water at some time in Mars' history. Around the same time the Mars Express orbiter detected the spectral evidence of water present in the polar regions. 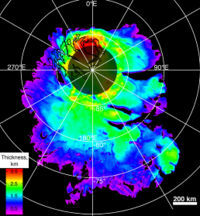 In 2005, Mars Express confirmed this by locating an area of solid water ice near the north pole. The Phoenix lander confirmed the existence of water ice in Mars. A MARSIS map of Mars' south pole ice deposits. On March 15, 2007, Mars Express' mission control released more news of extensive frozen water discovered at the Martian south pole. These new and highly accurate measurements predict that if the ice were to be melted, the whole planet would be covered in a liquid layer 11 meters deep. Although it has been known for many years that the poles have an abundance of ice, it has never been measured to this degree of accuracy. The data comes from the Mars Advanced Radar for Subsurface and Ionospheric Sounding (MARSIS) currently mapping the north pole to gain a better understanding of how much frozen water may be contained there. MARSIS can probe over 2 miles below the Martian surface and has found extensive layered deposits of ice. Mars shows evidence of extensive liquid water flowing on its surface in the past and it is the focus of many Mars missions to find out how this water has leaked away over the millennia. Martian polar ice may be the culprit, suggesting Mars may once have had a warmer climate, slowly cooling as the atmosphere became a more inefficient insulator for the meager heating from the distant Sun. Future manned exploration on Mars will require a source of water whether it is in the form of ice or sub-surface aquifers. The Mars Express orbiter has uncovered some confusing measurements suggesting there may be liquid water accompanying all that ice. MARSIS bounced back data suggesting at least 90% of the layered deposits under the polar cap are indeed supplies of ice, but a thin layer resembling liquid water is also evident. It is hard to understand the existence of liquid water at the extremely low temperatures predicted. Perhaps high pressures or small geological processes may explain these observations. Another orbiter, NASA's Mars Global Surveyor, has also returned some exciting new evidence for the existence of new flows of liquid water on the Martian surface away from the frozen poles. "What pressures are required to keep water in a liquid phase at temperatures as low as that on the surface of Mars? - Ioneill"
The Mars Global Surveyor arrived at the Red Planet on September 11, 1997 and returned a decade of data on the evolution of the planet before it was lost in November 2006 through energy loss. It was Mars' longest operational artificial satellite. The Mars Orbiter Camera (MOC) onboard revealed new deposits possibly carried as sediment by flowing water in two locations in the past 7 years (press release dated December 6, 2006). In images taken in August 1999 and September 2006 of the same location (Centauri Montes Region), a bright deposit measuring several hundred meters long is evident in the 2006 image but not in the 1999 image. 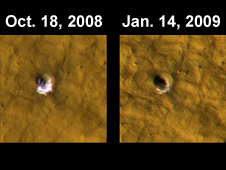 A similar feature was observed at a different location from 2001 to 2005 at Terra Sirenum. It is worth noting that both locations are in equatorial regions, not usually associated with ice or liquid water. This suggests liquid water remains a characteristic of the Mars landscape, if only sporadically. These discoveries have increased the enthusiasm for the search for microbial life, but the implications for manned exploration are huge. If there are pockets of liquid water just below the surface, Mars may yet be able to provide our future pioneers with natural springs more familiar on Earth. However, surface water on Mars is short-lived. The Martian atmosphere is very thin (a pressure of 7 millibars, <1% that of Earth's thick atmosphere) and cold (an average global temperature of -55°C or -67F), these two factors deny any long-term existence of liquid water. Surface liquid water will quickly freeze and sublime into the atmosphere, bypassing the liquid phase. This phase transition for water on Mars is much like the phase transition for liquid carbon dioxide on Earth when it is released from a CO2 fire extinguisher to produce dry ice snow and CO2 gas. The phase transition for H2O on the surface of Mars occurs below the "triple point" on the phase diagram so the recent observations of sediment on the surface will have been deposited very quickly by short lived "spurts" of water. Just how short-lived these spurts of water are it is unknown, but a significant volume must have created a formidable river to carry sediment several hundred meters. Although there may be other explanations for these long "channels" of sediment, such as rock slides or wind-blown sand features, the appearance of the deposits seem very water-like. Michael Malin of Malin Space Science Systems, a mission scientist for the MOC says, "The shapes of these deposits are what you would expect to see if the material were carried by flowing water... they have finger-like branches at the downhill end and easily diverted around small obstacles". It is also possible that other liquids such as 1,2-butanediol, 1,3-butanediol, 1,2-propanediol, 1,3-propanediol, ethylene glycol and related liquids could be responsible for fluid flow features on Mars. While such liquids would be relatively more rare than water, the resistance to freezing of such liquids and mixtures of such liquids with water would allow them to cause fluid flow effects where pure liquid water is impossible. Further support for the existence of flowing water comes from the first observations made by NASA's Mars Reconnaissance Orbiter (launched in 2005) where the High Resolution Imaging Science Experiment (HiRISE) camera spotted small fractures and cracks in the Martian canyon, Candor Chasma. The cracks analyzed show signs of mineral alteration in the rock exposed - a sign that liquid water once flowed through these sub-surface pipes. "What caught my eye was the bleaching or lack of dark material along the fracture. That is a sign of mineral alteration by fluids that moved through those joints. It reminded me of something I had seen during field studies in Utah, that is light-tone zones, or 'haloes,' on either side of cracks through darker sandstone" - Dr. Chris Okubo, a geologist at the University of Arizona, Tucson. Although this is a sign that the liquid water has since disappeared from these cracks and fractures in the canyon rock, it is interesting to find evidence for ancient water in abundance. The 1996 Mars Pathfinder mission discovered plentiful evidence that its landing site, Ares Vallis, was once the bottom of a huge valley system eroded by ancient water. Water production on Mars for settlement use or for exploration uses can take many forms. As a prime In-situ resource the presence of water on Mars is one of its main attractions. Further exploration is needed to determine if the water is available in a relatively pure form, or if it will contain salts and other chemical contaminants requiring water treatment. The Martian atmosphere contains a small percentage of water. With a device similar to an air dehumidifier the production of water should be feasible all over the planet's surface. An experimental setup is necessary to find out all about the viability of this approach. Since the discovery of caves scientists believe in the possibility of water ice on the ground of the caves. Water ice is abundant under the ground at least near the poles, and probably elsewhere too. The Mars Reconnaissance Orbiter has found evidence of glaciers covered in regolith. Radar reflection data indicates that these are not Rock Glaciers that have been previously suspected on Mars, but instead are thick glacial ice covered in a thin layer of debris. The buried glaciers lie in the Hellas Basin region of Mars' southern hemisphere with similar aprons detected extending from cliffs in the northern hemisphere. Water is present in the martian regolith both as ice and as hydrated minerals. 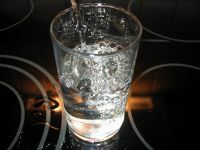 The human metabolism requires a regular intake of fresh water. Pure liquid water is non-existent on Mars but there is abundant frozen water and hydrated minerals. Since getting liquid water for use will require some industrial effort, the recycling of all excretion would provide advantages in reducing water use. There are two ways: Wastewater can be treated with technical means, which is partially done on the ISS already. Alternatively, the water can be kept in a nearly natural cycle, using parts of the greenhouses for biological wastewater treatment. The concentration of deuterium in Martian hydrogen and thus in Martian water is between five and thirteen ten-thousandth-parts. or about six times the relative abundance on Earth. Still this concentration is far from the 25% of the body's content of hydrogen that would need to be substituted by deuterium before there are any serious health effects. Deuterium is not a cumulative poison. At about one thousandth part of the hydrogen in Martian water, deuterium would be excreted as fast as it is consumed and would not be a health problem. Many industrial processes considered for a Mars settlement, in particular the production of methanol and methane and other hydrocarbons require hydrogen. This can be obtained by electrolysis, with oxygen as a byproduct. Most other processes require the use of significant quantities of water as a solvent for reagents such as acids or ammonia or a a coolant for high temperature systems. Deuterium from martian water may provide a source of fusion fuel for future energy production. 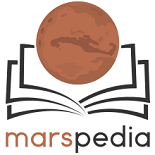 Searching for water with the Mars Express MARSIS instrument. This page was last edited on 11 April 2019, at 08:29.